I’ll be releasing a new series this year inspired by two of America’s most beloved characters–Huck Finn and Tom Sawyer. I humbly offer these stories with profound gratitude to the man who inspired them. Mark Twain, more than any other author, influenced my love for the written word and my belief in the power of a well-told story. 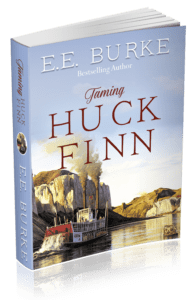 The first book, Taming Huck Finn, comes out Oct. 23, 2018. Look for the second book, Tom Sawyer Returns, in early 2019. From an early age, I’ve been afflicted with a fondness for two precocious Missouri-bred boys. Huck and Tom always seemed so real to me. I could place them in history, hear them speak, and see them in my mind as well as I could see my own face in a mirror. As I read (and reread) their adventures, I hated to bid them farewell at a point where their stories were just taking off. I wanted to know what happened to them when they grew up. Even into adulthood, I wondered, What if… For an author, pondering that question is a sure sign a book is about to be born. As I began to imagine all the possibilities, it was Huck himself who suggested the one that to me made the most sense. The cover features art from Missouri painter Gary R. Lucy. Cover art (painting): THE BENTON: The Benton Steaming Past the White Cliffs in Montana, 1878, by Gary R. Lucy. Courtesy of the Gary R. Lucy Gallery Inc., in Washington, MO. You can explore more of his beautiful historical paintings on his website. I hope you enjoy these new adventures. You can read an excerpt from Taming Huck Finn here. No city personifies the American experience quite like Kansas City. This year, our local writing organization took on a big project — to write history-inspired stories about our hometown, weaving fact with fiction and our own unique experiences and outlooks. The result is KANSAS CITY STORY. This rich collection takes the reader from the muddy banks of the Mighty Mo to the gleaming glass and steel of the Sprint Center. The journey highlights memorable moments in our river city’s intriguing history, beginning as a trading settlement in 1821. Written by local authors, this anthology covers 20 decades that reflect not just the story of a city, but also the story of America. I loved researching Kansas City and discovering historical gems and seeing what different writers touched on in their stories. This was a collaborative project with local authors who are writing buddies, friends, and mentors. Contributors include USA Today bestselling authors and several authors who are experiencing the thrill of debuting their first published works. My two stories, which cover two tumultuous decades, are inspired by actual events and historical figures. The Songbird — set 1863 — is based on an old newspaper article about an imprisoned singer and a conflicted officer. The Orphan and The Outlaw sees the James/Younger robbery at the Kansas City Exposition in 1872 through the eyes of an orphaned newspaper boy where his chance meeting with an outlaw leads to an unexpected outcome. 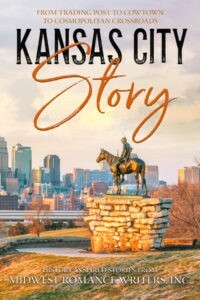 Proceeds from Kansas City Story will go to Midwest Romance Writers, Inc., a non-profit organization of writers helping other writers.